As a final hurrah for the summer, the Ward family girls decided to take a weekend for some relaxing rejuvenation time. Our destination of choice - Solvang, CA. We had one full day to do whatever our hearts desired. And what did we do? What do girls LOVE to do? We shopped! Solvang is a sweet shop-filled town. The Christmas store had us enamored for a good hour or so. 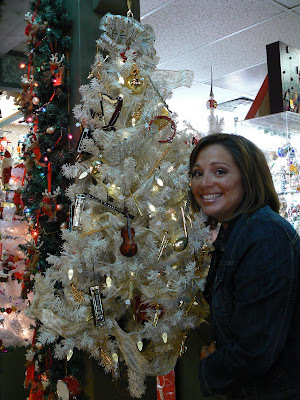 It was jam-packed with ornament after ornament in every shape and style. Of course we had to stop at the cupcake shoppe. This window display was soooo cute! And those cupcakes were as delicious as they look. Here's proof that we were actually in Solvang. What a cute bunch of girls! We ate a yummy lunch at a small outdoor cafe and then decided to catch a girly movie that afternoon. - Eat, Pray, Love. 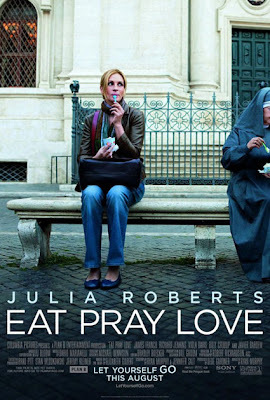 This movie had just come out and we are all Julia Roberts fans. It's always fun to see your favorites on the big screen. We were all entertained by this show. It was neat to travel the world with Julia's character and see her eat all of the great foods. 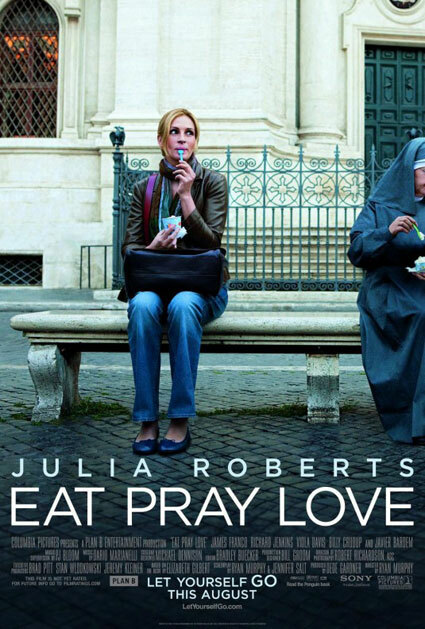 I read one review of this movie and thought it was spot on: Of the three (Eat, Pray, Love) verbs in the title, it was the "Eat" portion of the movie that the viewers enjoyed most. We got to see Julia EAT and EAT and EAT! And what was she eating? CARBS!! Pizza. and pasta. and gelato. Oh, it was fabulous. If the movie stars can do it then so can we! "Having a baby is like getting a tattoo on your face. You really need to be certain it's what you want before you commit." "I'm having a relationship with my pizza... I have no interest in being obese - I'm just through with the guilt." Tomorrow we're going to go buy some bigger jeans!" I give this movie 2 1/2 Thanksgiving turkey breakfasts out of 5. My low rating is because of the overall message/moral of the movie. It just wasn't in line with my own personal values. Surely a rental, but still entertaining. After the movie we had another fun adventure...car trouble! All of us ladies put our heads together under the hood and tried to figure out the problem. (How many women does it take to fix a car? Uh huh.) After calling all of our husbands we finally figured out the problem. The battery in Aimee's car decided it was time to pass on. One phone call to AAA, one run to the automotive store, and one hour later we were back in business. Kristen, this is for you! 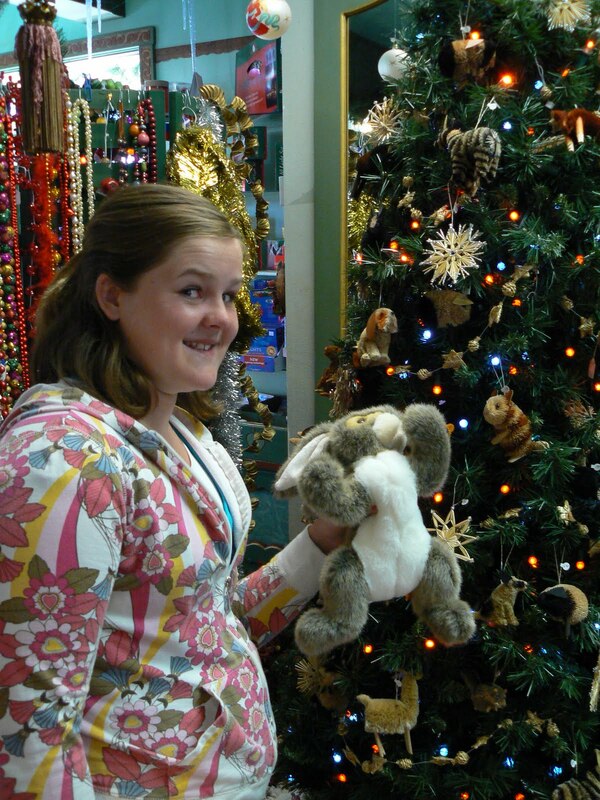 As I said before, we did our fair share of shopping this weekend. After our car repair fun we finished off our evening at Ross. Everyone found something sweet to take home. 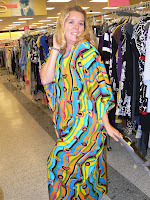 Kristen especially enjoyed this muumuu. She had no problem trying it on and modeling down the middle of the store. LOVE that inhibition!! All in all it was a great trip. Hubby, thanks for urging me to go and convincing me to leave you at home with the kiddies. Ladies, thanks for the fun and the memories.